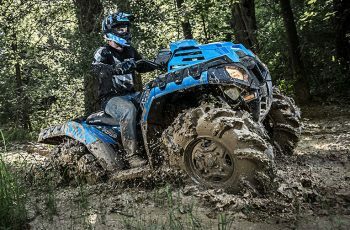 The Polaris Sportsman ATV is hands down the industry's best selling automatic 4x4 ATV. It's the one you want when you're ready for the toughest trails with the biggest thrills. It's also the one you want for the biggest jobs an ATV can handle. This serious performer gives you incredible towing and load capacity, and still brings home the smoothest ride. The Sportsman is designed to withstand anything; it powers through the roughest farm yard, the most difficult pastures. and the rockiest, toughest trails with its hardest working features. Some kids seem to be born ready to mount an ATV. If your youngster is 10 or older, introduce him to the Sportsman 110, designed for kids to ride with adult supervision. This machine comes with parent adjustable speed limiting, with settings as low as 10 MPH and maxing out at 29 MPH. The electronic fuel injected 122 cc engine offers consistent starting, improved idle quality, and crisp throttle response. An electric start make it easy for youngsters to hit the trail. Long-travel front and and rear suspension soak up the bumps. 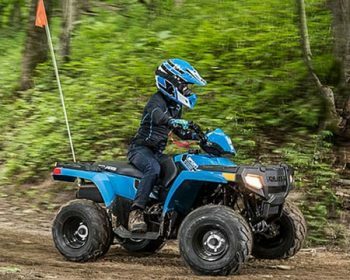 The 110 comes with a safety helmet, running lights and safety whip flag as standard equipment, and is available in several kid-inspired colors. 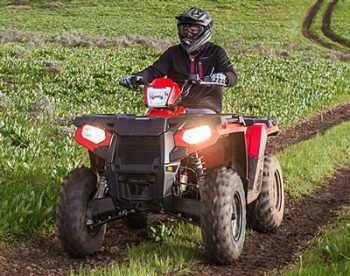 This hard working ATV comes with true on-demand all wheel drive for when you need that extra traction; it automatically reverts to 2 wheel when not needed. Full 10.5” ground clearance promises a smooth ride on any terrain. The Legendary Smooth Independent Rear Suspension system gives the best ride, maximum traction and best handling. Single lever brakes control front and rear brakes; there’s also a foot brake for rear wheel braking only. You'll appreciate the 270 lb rack capacity (front and back combined). Flat racks and integrated steel tie-downs secure your cargo. The Lock and Ride Accessory system allows you to adapt on the fly, adding what you need when you need. Hundreds of accessories are available. Go from trail to work to hunting in just a matter of minutes. Comfort comes standard, with a contoured seat, and spacious flat footwells with integrated traction elements. The 570 starts flawlessly and runs smoothly in varied temperature and altitude. True on-demand all-wheel drive, and a massive 1,225 lb. 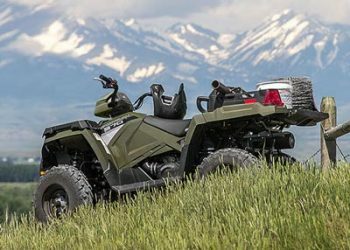 towing capacity means the 570 works harder than nearly all other ATVs. It features the Lock and Ride System, 44 HP engine, Electronic Fuel Injection (EFI) and Dual Overhead Cams with 4 valves per cylinder. It also has the most integrated storage of any ATV. The 6.5 gallon capacity lets you stow loads of gear. An Integrated Winch & Plow Mount System means you can install or remove your plow system in under a minute with no big bulky mounts. Tackle some of the toughest terrain with a full 11" ground clearance. Sportsman's® Legendary Smooth Independent Rear Suspension System gives you 9.5" of wheel travel for the best ride plus maximum traction. Single handed braking automatically applies braking force to the front and rear wheels. Rear wheel-only braking is done with a foot pedal. Standard comfort features include a contoured seat and spacious, flat footwells with integrated traction elements for solid footing. This machine has many features of the 570, but takes it all to a higher level. It easily switches from 1-up work and trail mode to 2-up trail mode in less than 10 seconds. Unlock the rear differential and you'll have a tighter turn radius and can protect turf and other sensitive terrain. And simply flip the switch to lock the rear differential for true two-wheel drive. 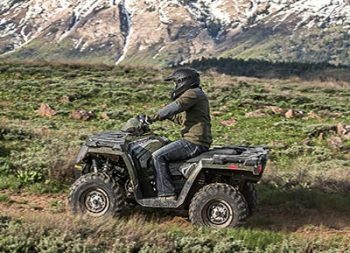 The Polaris PVT Automatic Transmission allows easy shifting between all gears. Need a large rear dump box? The x2 570 can hold 400 lbs. of material and supplies. Pack in all your gear for a long day on the trail or hunt, or load it up with materials and supplies for any job. The Lock and Ride Accessory system allows you to adapt on the fly and accessorize your ATV with any of the hundreds of Lock and Ride accessories. Your passenger has it good, too: With over 4” of cushion and an adjustable back rest, the convertible rear passenger seat provides all day comfort. Mud riding your thing? Then this is the ATV for you! Purpose built for the mud with stock 29.5" High Lifter Outlaw II tires, the 850 gives you exceptional ride and handling, with plenty of grip. And you can choose your gear for mud crawling or the ride between mud holes. Rear suspension fully articulates for superior traction and control. Superior cooling, and less clogging, comes from the relocated, rack-mounted radiator with inverted dual fans. Other mud-loving features include a shielded snorkeled clutch and engine ducting for minimal water and debris ingestion, and a hi-clearance arched Dual A-Arm suspension to maximize ground clearance. Stiffer springs also fight back when the mud piles up. Sealed single beam headlights and a sealed key switch keep the gunk out, and large, quick clearing floorboard cutouts limit mud compaction to help maintain rider control.